Home › Signpost Theology › The Man Most Used by God to Seal Daniel? What does this verse really mean? The fourth kingdom down from the top in the metal statue of Daniel 2 must smash, must break up, must pulverize, the empires above it – the Babylonian, Persian, and Greek Kingdoms, just as iron smashes gold, silver, and bronze. Just about any Bible commentator’s writing on the topic will mention Rome’s conquest of these empires. Of course just simply conquering an empire does not include breaking it up. The word translated break in Daniel 2:40 is deqaq (Strong’s #1855) and it means to break up into little pieces – to pulverize. What is missed in popular theology is the idea of pulverizing – breaking an empire into bits so that the empire in question is unrecognizable. Islam, of course, did this to Babylon, Persia and Greece by changing these empires’ languages, religion and culture. The Empire of Iron Legs is different from all the other empires in the statue in Daniel 2:40 because it acts on all the others to pulverize them. Rome never pulverized any of these other kingdoms, but during medieval times, Islam did (see Chapter 1 of Daniel Revisited). Theologians through the centuries believed that to crush the other empires, Rome would have had to at least conquer them. That was good enough apparently. The earliest theologians like Hippolytus and Jerome had never seen Islam and so had never seen what a realm like Islam would truly do to the other empires in the way of pulverizing – making the empires unrecognizable from the pre-conquered state. So just the mere act of conquest was good enough to meet their definition of crush. As far as I was able to find, Hippolytus, a bishop of Rome around 200 AD was the first to suppose that the iron legs of the statue in Daniel 2 was Rome. What had happened prior to Hippolytus’ time to make him say it was Rome? Three-and-a-half centuries prior, Rome conquered Greece (the bronze belly and thighs) in 146 BC. Greece was later organized into a Roman Province in 27 BC. That was easy. But it was not until around 116 AD that Rome successfully conquered Babylon (the gold head), and a piece (not the entirety!) – only a piece – of Persia (the silver chest and arms). Babylon and the Persian provinces were only held on to for a few months, but I suppose a conquest is a conquest in some people’s minds. So who was the enabler for this military campaign allowing Rome to claim conquest of Babylon and a slice of Persia? It was Emperor Trajan. 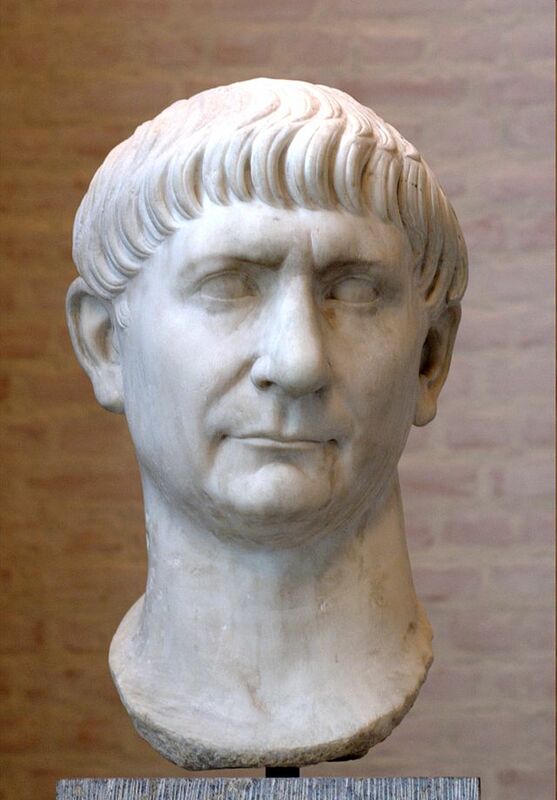 Trajan was 45 years old when he became emperor of Rome in 98 AD. He spent the first decade of the second century expanding the Roman frontier along the Danube in what is now Romania. Finally in 113 AD at the ripe age of 60 he embarked on a campaign to conquer Persia, fancying himself as the next Alexander the Great. Of course Alexander really did conquer Persia – all of it – but Trajan only conquered the regions of Armenia and Mesopotamia as shown on the map. To conquer Persia he would have had to go all the way to India. As one can readily see, he got nowhere near India, despite the fact that adoring historians 200 years, like Eutropius, claimed that Trajan had indeed conquered Persia all the way to the Indian border. Today we know this as a great exaggeration and is simply not true. 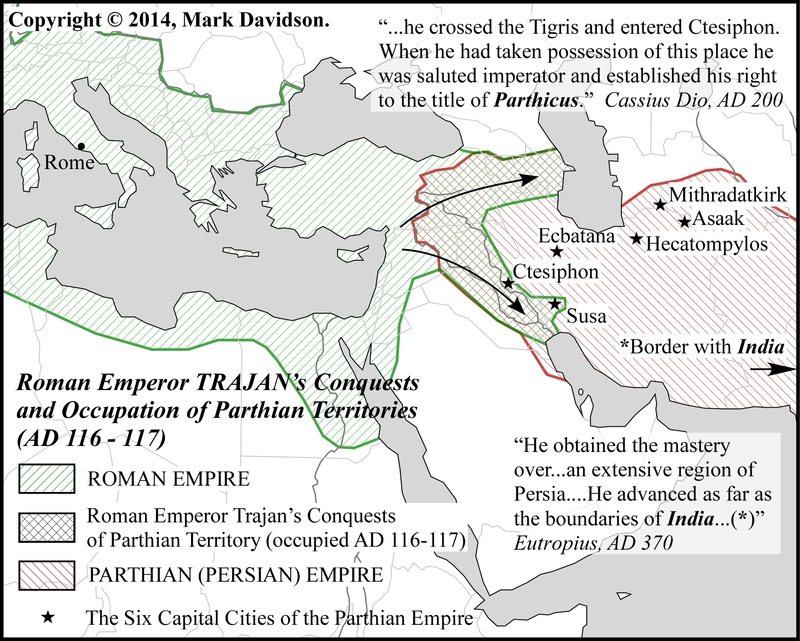 Map shows the true extent of Rome’s conquests of Persian/Parthian territory, with Eutropius’ exaggeration. Four years into his campaign he died from a mysterious disease, at age 63. His conquests for Rome were quickly relinquished. The Senate back in Rome granted Trajan the title Parthicus – victor over Parthia (Persia). 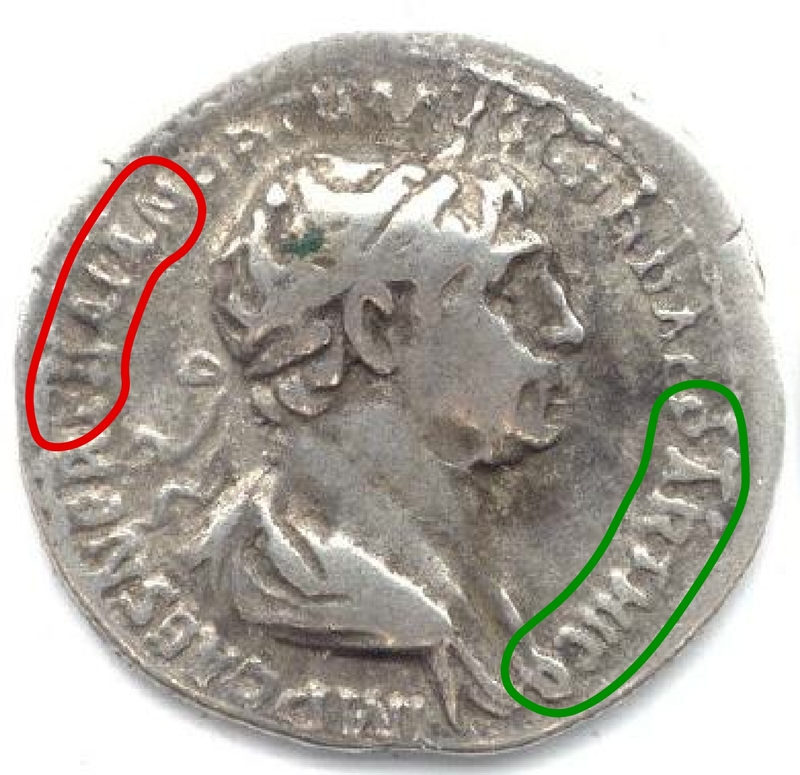 You can see the emperor’s name TRAIAN and his title PARTHICO on the coin. TRAIAN encircled by red, PARTHICO encircled by green. Back in those days one of the most effective newspapers and advertisers were the silver coins used to pay workers and placed in general circulation. Seeing these coins everyday it would have been believed by the common man that Trajan, i.e. Rome, had indeed conquered Parthia. Therefore, the two greatest factors that worked in league with one another, in my opinion, are that (1) no one really knew how to apply the word deqaq appearing in Daniel 2:40 to real world empires, and (2) ancient Roman historians many centuries ago exaggerated Trajan’s achievements in his battles with Persia. However, as Daniel 12:4 says the scroll is to be sealed until the end. Not thinking through and seeing real life examples of deqaq coupled by an emperor with an eagerness for military greatness both readily fed the habit of men to willingly shoehorn an interpretation into prophetic Scripture to fit their time because they think their own time is the end time. But now we can look back over the centuries with the benefit of those who ran “here and there to increase knowledge” (Daniel 12:4b) of history of the Roman Empire and the Islamic Empire – those who travelled to archaeological dig sites to find out that the soldiers that destroyed Jerusalem were not Romans but Syrians, and to places within the Roman and Islamic Realms to find the answers that Muslim armies captured many lands and empires which allowed Muslim law and society to convert all people in those lands to Islam over centuries. Deqaq was assigned an imperfect meaning to Rome in that Rome would simply conquer a land without any regard to the fact that that land’s language and culture would conquer the Roman Empire (I speak of the Greek Empire). And that this imperfect assignment of deqaq was given Persia as a candidate due to the Roman Emperor known as Trajan. If Trajan had never assaulted Persia as he did, perhaps theologians would never have been able to truly say that Rome crushed all the other empires, per Daniel 2:40. They would have perhaps waited to find a candidate for the iron legs, and seeing Islam’s achievements might have assigned Islam to the iron legs in the time of the Renaissance. But no, a man named Trajan became emperor of Rome and conquered two outlying provinces of Parthia. He gave theologians a candidate for Daniel 2:40. The rest is history. Reblogged this on Daily Prophecy Digest. This post along with your Appendix on the chronology of Daniel 2:40 in your book is one of the very BEST reasons and highlights of why your book, “Daniel Revisited” is as equally important as your Signpost theory/message in my mind, Mark. It was one of the main reasons I gave you five stars on my Amazon review of your book as a reader and now firm supporter. This is why this new edition is vastly superior to your first book, you put the nail in the coffin of the heart of a Roman/European end-time theory and silence it forever as the final kingdom that persecuted God’s people. The Roman theory supporters have no defense to this because truth is an absolute defense! This is what separates your fine work and argument and firmly builds on what Joel Richardson’s ground-breaking work has established for me within the Islamic Paradigm eschatological position. If just somehow pastors and seminary professors could teach their students this vital correction, much of the church body would NOT be asleep today! I really feel that if the average Christian truly understood the Islamic paradigm they would understand the urgency of this very late hour that Joel calls for on his blog to spread the gospel of Jesus to the world, but especially the 10/40 window! When prophetic scripture becomes clear and tangible in the modern world we live in, we are indeed the generation that will see the physical return of Jesus of Nazareth! Come Lord and amen! Actually I heard an interesting defense of the Roman Antichrist theory the other day. This defense (if you can call it that) was that Rome’s conquering of Babylon and Persia is yet future! And that when the Antichrist comes to power he will conquer these nations and finally fulfill Daniel 2! Imagine that. That ranks right up there with the defense of the Alaskan Antichrist theory. Unfortunately tradition dies hard, and in some cases, not at all. Prejudice of Catholics drives much of this and has for hundreds of years. So many people have a family history and/or national history of hating the Pope and the Catholic Church, falling into the Roman Antichrist theory is easy and helps justify these feelings. I thank the Lord that He keeps using His people to reveal the mysteries of the end times. He wants us always to be prepared for the coming times shortly ahead of us. Let us all be faithful to do His will in proclaim His gospel where ever we go. Keep up the good work. Mark, Wondering if you saw this and would provide your thoughts please? Thanks for bringing this to my attention. The article you link at prophecy news watch is by Ryan Mauro from Clarion Project. Clarion is secular; that site as well as many Christian prophecy sites seem to now be taking pieces of information and weaving a scenario for how things might play out. The problem with all of these like I wrote about in this post, is that none of them are based on a solid or reasonable interpretation of Daniel 7 and 8 and they definitely don’t know the Signposts. Twelver Shia (such as Iranian leadership) belief is to stir up chaos within the Islamic world to cause the Mehdi to appear. And it just may happen. But the death of the Saudi king is not significant to the Signposts. And just like Walid tried to come up with a Turkish-Iranian alliance by misreading the tea leaves, so the article you linked is reading too much into men’s “prophecies” – all of it unbiblical. The bottomline here is to not allow oneself to get caught up in so much hype that is not biblically based. The Biblically-based Signposts tell us that Assad will most likely fall and Iran will most likely invade, but the Mehdi/Antichrist is still another two signposts away after that. The article ignores Turkey also. One last thing – so many prophecy teachers give scenarios saying “what if” but they ignore the consistent and methodic interpretation of each and every verse of Daniel 7 and 8, and ignore the keys given us in Revelation.